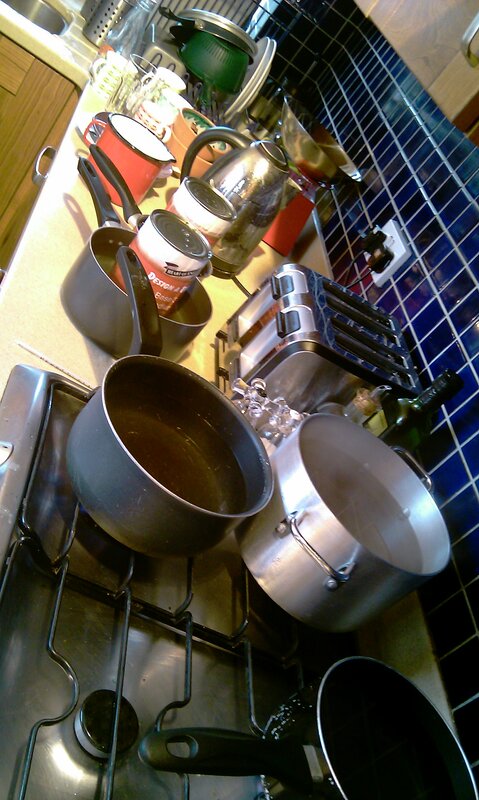 I’ve recently been getting very excited about the idea of self-sufficiency. You know, growing your own, making your own, finding ways to make the chain from ground to mouth as short as possible. It’s been exciting, and my next post (which will probably be posted within an hour of this one, can you wait?!) will delve into that in more detail. 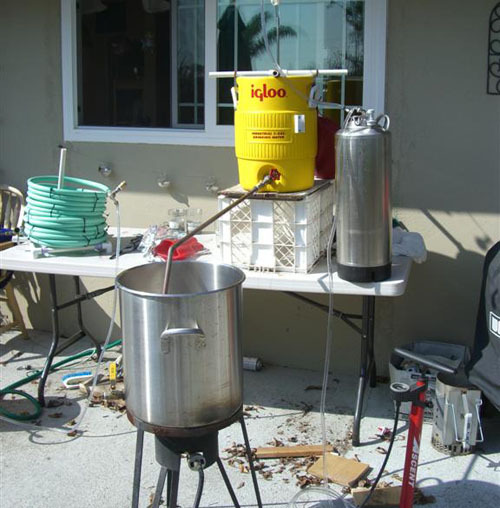 One great way to cut costs and make your own is to make homebrew. Beer is quite expensive (I’ve been known to pay up to £7 for a good bottle of beer, not a lot by beer geek standards, but a fortune by most people’s), and I drink a fair bit of it (I’ve not got a problem, but probably have a bottle at least one in every three nights). Now, my only problem with my first batch of homebrew was that it wasn’t all that great. It was ok, but it cost about 50p a pint and, boy, could you tell! Batch number two is currently undergoing secondary fermentation in the bottle, and thus will not be drinkable for another four weeks (dang!) but I’ve got high hopes. See, the folk at Abbey Home Brew (a great homebrew shop on Kirkstall Road Leeds, near the big Morrisons) have a new kit called Design-A-Brew that’s designed as the middle ground between a full mash brew (expensive and an arse) and kit brewing (easy, cheap, not that nice). It’s very clever. You buy two cans of malted barley (in a range of colours and bitterness) and then you buy extras, like different malts, hops, yeasts and flavourings. Most of which come in a tea-bag style holding-thingy, so they impart their flavour with filling your beer full of crap (homebrew comes with enough sediment already). I’m making a nice spring ale with lemon grass and cascade hops. It smells nice already. 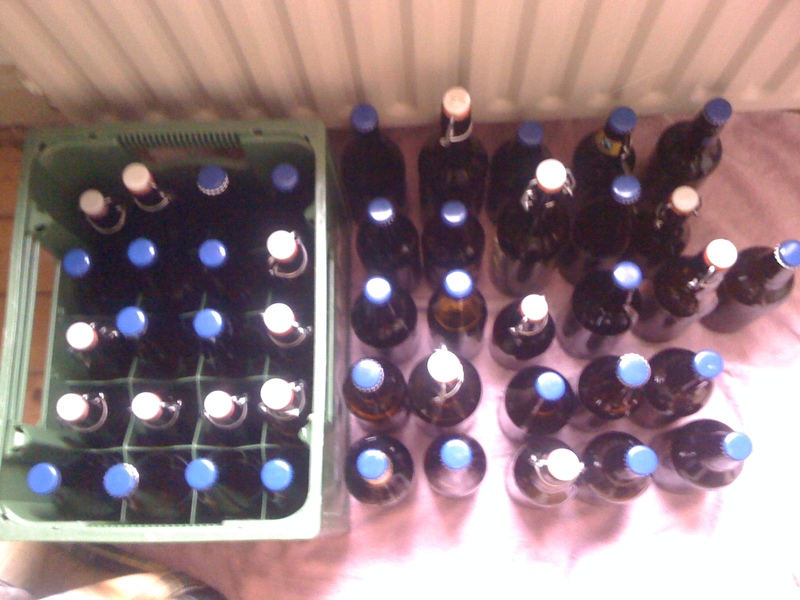 And, as a nice bonus, these 46 bottles will mainly be drunk at my wedding in September (alongside a cask or two from Roosters in Knaresborough – stiff competition indeed). I hope the guests like it! My girlfriend gets regular mentions on here for buying me nice beer related gifts. One of (probably the) best has been homebrew course that I went on this weekend just gone. Run by a nice Brummie chap called Brian, this homebrew course, in Hove Edge Brighouse, is run without any pretension. Brian is not an expert brewer. He has never brewed commercially, or industrially. What matters is that his homebrew beers, made in his kitchen using pretty basic equipment, are good (good but not exceptional). The purpose of the course isn’t to set people up to make the extreme beers of Stone or Brewdog, nor the exceptional smart ones of Thornbridge or Sierra Nevada. The aim here is to get passed the scarily scientific language of homebrew books, instil years of experience into new homebrewers and, in essence, just to show you how to do a basic mash homebrew and get beyond those rather uninspiring cans. It does pretty much exactly what you’d want. Brian talks you through the process from weighing the malt, to mashing the malt, to boiling, to the various ways of bottling and barrelling. We brewed a Moorhouse Pendle Witch and a darker, stronger off the top of our leader’s head. Obviously the time it takes to brew means that we didn’t get try the beers (they’re still brewing at the moment), but the samples of other Hove Edge beers, showed Brian to be a proficient brewer. The company wasn’t bad either, a couple of brothers from down south, a pair of mates from Chester and, best of all, two very funny, very enthusiastic Irish vets, intent on giving up the business and setting up a brewery under the questionable name of ‘The Horny Brewers’. While I’m not sure about the moniker, their passion was great and their desire to create heavily Belgian influenced beers won my approval. Has it worked with me? Well, yes. I’ve made one tin-based homebrew before and wasn’t too fussed by it. With the information from this course behind me, all I know need is £100 worth of equipment (which isn’t very much when you consider how cheap it makes brewing beer) and a free weekend. I’m on it, and I’ll share the results of my brews here when I get round to it. You can find out about and book onto the very reasonably priced (£40 for two days) course here. On top of brewing lessons, over the two days, there’s loads of beers to try, lunch and an infinite supply of tea and coffee. Things have been quiet round these parts for sometime now. Almost an entire fortnight infact. What with Christmas, traveling around the North of England to visit various friends and relatives and a general laziness that comes from having ages off work, I didn’t get round to any blogging. I did, however, get round to some mighty fine drinking. Again, it being Christmas and all that, the drinking was largely social and often in the kind of quantities beyond normal responsible levels (especially if the people who inspired Pete Brown’s latest blog are to believed [they really shouldn’t]), means that some beers are remembered just sketchily, others very well, and none have any kind of notes to be taken with them. So I’m going to bash through December and the start of 2010 at pace. Here we go. Christmas Eve started well. Well, it didn’t, we were meant to go up to Burnley for a party but the never ending bloody snow foiled that. Solution: a trip to North Bar. As we were preparing to order, the splendid manager there, Matt, informed me that Crown Brewery’s Django Reinhardt – a damson porter – was about to come on tap. I instantly ceased my plan to order a Stille Nacht and waited with baited breath for the recommendation. It was worth the wait, rich in fruit flavours, warming and powerful it’s a perfect winter tipple and it got me all ready to settle down infront of the telly with a DVD of Bugsy Malone. Next up, inevitably, was Christmas day. Drinking-wise today was all about Bucks Fizz (a bottle of Champagne was polished off between the two of us, before lunch, naturally), loads of muy dulce sherry from Beer Ritz. This stuff, Valdivia Pedro Ximenez, is, as the tag in Beer Ritz says, “nectar of the Gods”. It’s honey and treacle and currents and pudding and all the sweet tastes of Christmas rolled into one. I did, however, break out a Chimay Bleue to accompany our vegetarian Christmas dinner of mushroom pie. A great beer, packed full of complex flavours, it went down a treat. 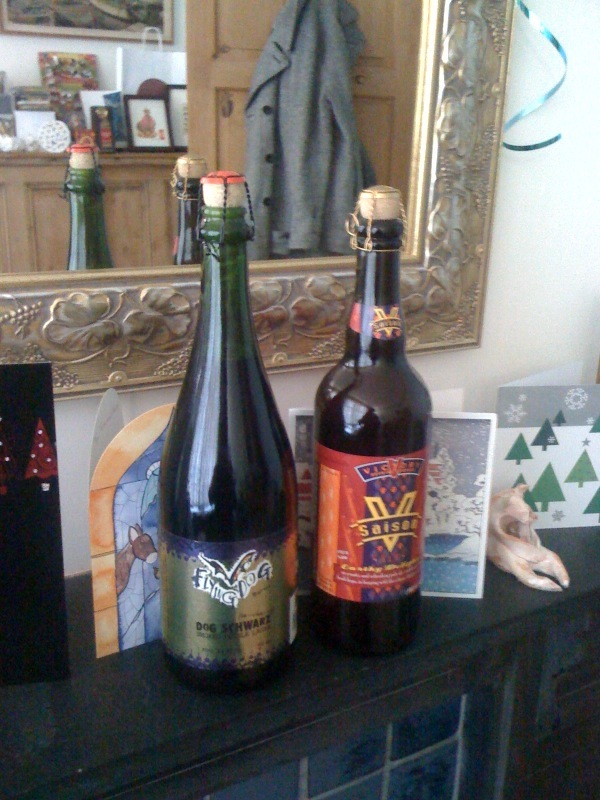 The real beery treat on Christmas day, though, was two of the presents my thoughtful girlfriend got for me. Having taken advice from Zak at Beer Ritz, she’d been out and bought me corked 75cl bottles of Flying Dog Wild Dog Schwartz and Victory V Saison. I’ve not dared drink these yet – I’m waiting for a special occasion. 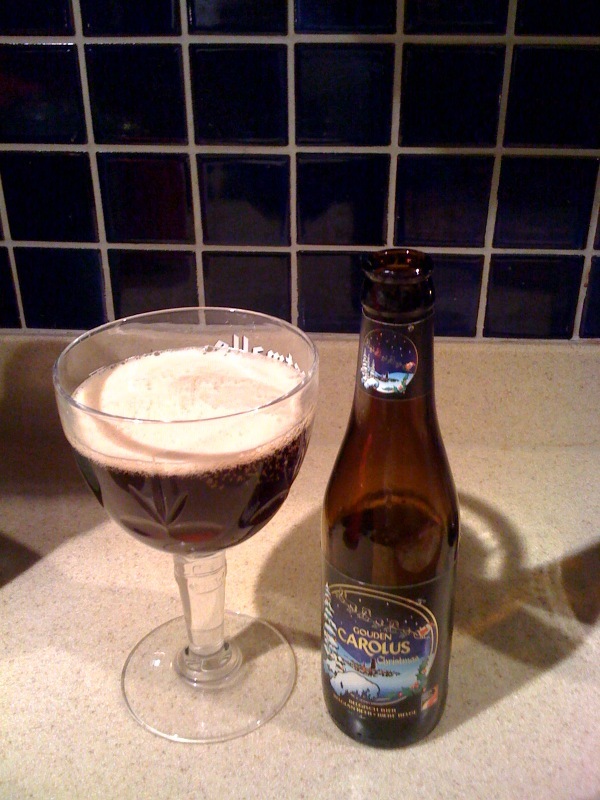 Boxing Day meant more of that heavenly sherry, and visits to family, all finished off superbly by Gouden Carolus Noel a special Christmas beer that was just that – special and Christmassy. The dark brown beer was heavy, spicy and figgy and a superb nightcap. The 27th was another family day and as soon as my driving was over, I indulged in a Dark Star Espresso Stout. For a 4.7% beer it’s surprisingly rich in flavour and manages to pack in a really rich coffee flavour without overwhelming that comforting warmth you’d want from a stout. The beer presents continued here, with my folks getting me a Yorkshire ale box (two Copper Dragon beers and a great Sam Smith’s Taddy Porter) and my brother getting my two beers from Sheffield’s Kelham Island plus a cheese washed in the curds from their Pale Rider, which was interesting. A real taste experience which took some getting used to (cheese and beer work well eaten and drunk side-by-side, but combined in one is a little more acquired) but eventually kept my palate very happy indeed. From there, it was days in Lancashire centered around the wedding of two friends. I shan’t go into details but it was an amazing do, complete with dancing, surf rock, great food and, most importantly, a lovely couple getting hitched. As an aside they also provided a cask of very local Hen Harrier by the Bowland Brewery. As you’d want for a wedding (and a subsequent NYE party which it lasted for) it was easy drinking, crisp and pale with some nice citrus flavours. New Year’s Day (aka my birthday) was a day to break out a couple of quality beers, namely the aforementioned Samuel Smith’s Taddy Porter, really amazingly rich with roasted barley flavours, and even better the BrewDog and Mikkeller Divine Rebel. This beer, a collaboration between two very impressive craft brewers, is partly aged in whiskey barrels and the taste tells you that straight away. It’s full of toffee and caramel flavours and packs a mighty punch. An even better beer-related occurrence on that day, however, was another present from my wonderful girlfriend. This time it wasn’t beer, but the ability to make beer (give a child a fish and he’ll be able to feed himself for a day, give the child a net and he’ll be able to… and so on). Yup, she signed me up for a two day homebrew course in February. I will report back on that in good time. Which brings me to my final subject. My homebrew. I made some back in November. Because my house is cold it took ages, but it’s ready to drink now, and also in hands of numerous friends and family members across the country. What’s it like? Well, it’s from a kit called Old Homewrecker, but it’s only around 4.5%. It’s a darkish winter ale and, like all novice homebrew, it’s just about ok. It’s drinkable, but as it has no hopping to speak of, it likes anything like a real depth of flavour. Plus, it’s got a fair bit of sediment in. We don’t have a name for it yet. I expect my next brew, post-course, will be far better.